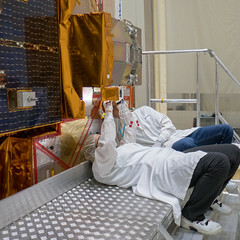 The day before launch, and the process of fuelling the Rockot launcher that will take Swarm into orbit has started at the Plesetsk Cosmodrome. Yesterday evening the State Commission authorised the go-ahead to fuel the launcher. This formal authorisation confirms that launch can take place, as planned on 22 November at 13:02 (CET). The authorisation follows a formal review, which concluded that the satellite, the launcher, the launch pad, the cosmodrome and the ground station network is ready. Fuelling therefore stated this morning at 07:00 CET (10:00 local time) and should be completed by 22:00 CET.